27 July 1937. Permission of Kelly Collins; all rights reserved. 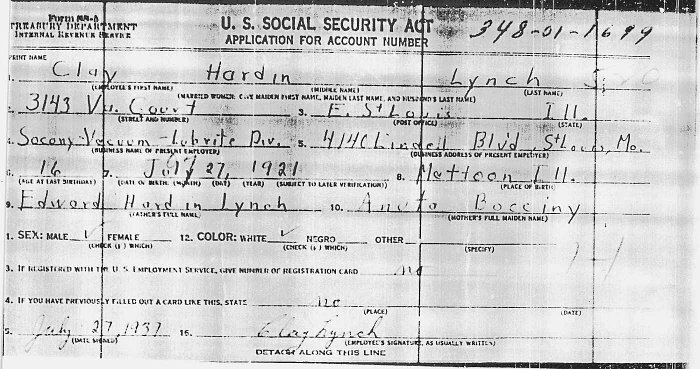 On 27 July 1937, Clay Hardin Lynch applied for a Social Security Account number. He identified himself as a 16 year old, white, male; born on 27 July 1921 at Mattoon, Illinois; a son of Edward Hardin Lynch and Anuta [sic] Bocciny [sic]. At the time he was residing at 3143 V[u?]. Court, East St. Louis, Illinois and was employed by Socony-Vacuum - Lubrite Division, 4140 Lindell Boulevard, St. Louis, Missouri. According to information from the members of the extended Lynch family, Anita Bocinny and Edward H. Lynch were married in May 1929 at New York City. It was Edward's second marriage and there were no children born. While Clay may have grown up regarding Anita Bocinny as his mother, it seems likely that Clay's birth mother was Edward's first wife, Francis Thomas.